It’s got a mouth with the teeth here and a tongue that is protruding. Lot of times on a bear you’ll see that. But it’s got a human nose with the nostrils, the eyes, eyebrow, and then a little short ear on top. So with the short ear on top, I would pretty much guess that it’s not a human figure, even though it has a human nose. Chief Sheiyksh (or Shakes) VI of Wrangell owned this engraved copper rattle depicting a bear with human features. It is ornamented with human hair and abalone shell. Clan leaders might use a rattle like this at a ku.éex’, or memorial potlatch. 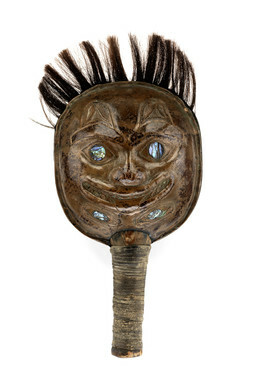 To learn more about the history of this object, read a report by Smithsonian conservators at http://anthropology.si.edu/accessinganthropology/alaska/gallery_rattle.html (copy and paste this address into your internet browser).